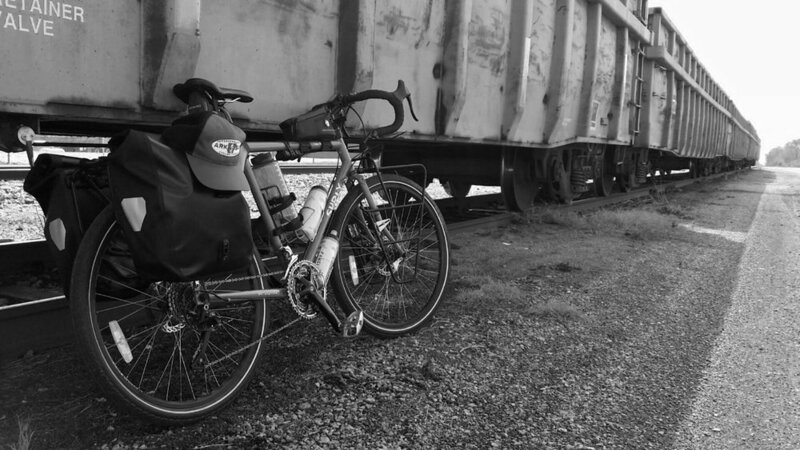 Sterling Minick, a bus driver for the Rogers school district, reflects on the freedom and joy of bike commuting and mountain biking. Freedom. That’s the first word that comes to mind when I think about riding a bicycle. Whether it’s commuting to work on a road bike, flying down a single track on a mountain bike, or just casually pedaling along a boardwalk in flip flops on a single speed beach cruiser—if it has two wheels and pedals, then it provides for me a palpable sense of freedom. One of my earliest memories as a child is the day that my dad removed the training wheels from my bike. I was four years old, and like so many children the world over, after some inevitable trial, error, and, ultimately, success, I was hooked. That initial sense of freedom, of liberation, was seared into my mind and has stuck with me ever since. At age 38, I’ve been an avid road cyclist for many years now, though mostly just recreationally. It’s only been within this past year, however, that I’ve began utilizing a bike—more so than a car—for transporting myself to and from work. As a school bus driver for Rogers, I leave the bus lot at 6AM and then again later in the afternoon. This means that I travel to work and home twice per day. My commute from my home in Prairie Creek is just over 10 miles one way and I try to ride my bike both morning and afternoon as much as possible, which puts my daily trip at approximately forty miles. I guess you could say that I’m an early-to-bed, early-to-rise kind of guy. A typical morning begins with me waking up at 3:30AM, brewing that all-essential coffee, fueling-up with a hearty bowl of oatmeal, packing my panniers, and hopping in the saddle by 4:45AM. Needless to say, it’s still very dark at this time, so a bright white headlight and flashing red taillight is a must. I can’t stress enough the importance of being visible out there. In order to avoid a particularly dangerous section of the heavily-trafficked and narrow-shouldered Highway 12 between Prairie Creek and Rogers, I take detours along much safer and more pleasant neighborhood side roads. These are nice quiet tree-lined roads with beckoning names such as Pleasant Ridge, Pikes Peak, and Dream Valley. Part of my route also takes me through a wonderful portion of the newly-developed and very bike-friendly Lake Atalanta Park. This time of year can be especially nice during these early morning rides, as I’m often greeted by an orchestra of frogs, crickets, and whippoorwills, while the moon plays peek-a-boo through the thick forested canopy above. I really enjoy the many long, steep, and snaky hills on my commute—the steeper the better—actually. I like to say that I prefer hills that require low gears and ample lungs. This 10-mile commute typically takes me about 40-45 minutes. Sterling's commute takes him by Beaver Lake. So why do I do this? Why leave my perfectly good car sitting cold in the garage and opt to ride a bike instead? Well, there are several reasons. One obvious one is the built-in cardio workout it provides. It’s a great way to build up and maintain physical fitness. What may be less obvious to some is the very real benefits that exercise in general—cycling in particular—can have on improving one’s mental fitness. It certainly improves my overall mood. After riding a bike, I show up to work more energized, focused, and ready to tackle the task at hand. In short, I show up to work happier. There’s also something very satisfying about transporting yourself via your own clean, renewable, self-produced power. It feels very good to know that while riding my bike, I am greatly reducing my overall carbon footprint. Saving money on gas and mitigating the wear and tear on my vehicle is a nice bonus as well, no doubt. Mountain biking is something that I’ve only discovered within the last year, but I’ve really taken to it. With so many great trail systems, Northwest Arkansas is a mountain biker’s heaven. Like road biking, mountain biking does require stamina and endurance, but it adds many technical challenges to the mix which are largely absent in road cycling. One can pretty easily get lost in daydreaming while road cycling, but get caught daydreaming while mountain biking and you are liable to find yourself wrapped around an unforgiving oak tree. In other words, mountain biking demands constant focus and attention. Nothing locks my mind into the present moment and holds me there like mountain biking does. The thrill that comes from mountain biking can become quite addictive, and I’m not ashamed to admit that I’m hooked on the sport. It was my 12-year-old son who initially got me interested in mountain biking. He heard about NICA (National Interscholastic Cycling Association) through his school and asked if he could join the local Rogers team. Shortly thereafter, I realized that mountain biking could be a great way for my son and I to spend some quality time together. So, I bought a mountain bike and began riding along with the team. It was a lot of fun watching the kids on the team progress in their riding skills throughout the season and build strong bonds of friendship throughout the process. I enjoyed the experience and the NICA community so much that I decided to go through the training this past year to become an assistant NICA coach. It is my hope that I can help motivate more kids to get outside and develop a life-long love for cycling. Northwest Arkansas is a terrific place to ride and I would encourage anyone who can to get out and ride a bike as much as possible.